Start and End of Walk: Sloane Square Tube Station. 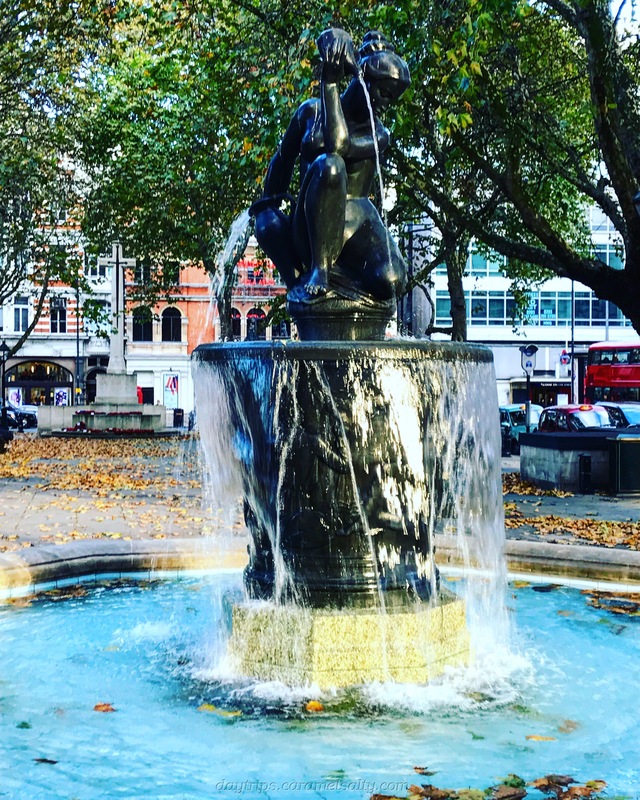 Whilst the walk dips in and out of the now gentrified King’s Road with its upmarket shops, its focus is really the legacy of the literati that congregated here in the 19th century and the surprising array of art from pioneers of art movements. This includes a building designed by Charles Rennie Mackintosh, a church window by William Morris and an unfinished sculpture by Jacob Epstein. The walk then culminates with a visit to one of the finest contemporary art gallery in the world based on Charles Saatchi’s collections. s after suffering WWII bomb damage. Across in Sloane Terrace, is Cadogan Hall, whose resident orchestra is the Royal Philharmonic. Round the block is the Holy Trinity Church. It’s attractive arts & crafts interior includes an amazing east window by Morris & Burne-Jones featuring 48 saints, starting with St. Peter (the one with the key), and ending with St. George. Return to Sloane Square, then along King’s Road, turning right into Blacklands Terrace. Then at Draycott Place, cut through the back streets to Elystan Place, onwards to the petite Chelsea Green. Then go left down Godfrey Street, with its delightful colourful houses. Next, via Britten Street is St. Luke’s Church. This 2500 seat church (1824) is where Charles Dickens married Catherine Hogarth in 1836.
cross Fulham Road into Sydney Place. Bela Bartok, the Hungarian composer, spent some time in London and always stayed at 7 Sydney Place with his friend Sir Duncan Wilson. Further up the road, just outside South Kensington Station is a statue of Bela Bartok. Turn left towards the Royal Marsden Hospital, passing 28, Sumner Place, home of Joseph Aloysius Hansom, inventor of the popular Victorian hansom cab. At the first traffic junction to the right on Fulham Road, is Sokol Books Ltd, specialists in books printed before 1640. Do peer into their museum like window display. e oldest street in Chelsea and has some unusual buildings, such as the clock house at #123A, with clock in tow, and the swan over #109. At the end of Church Street is the sunken Roper’s Garden. It was once part of Thomas More’s orchard, which was his daughter’s (Margaret) wedding gift. She married William Roper. Three items to look for are the unfinished Jacob Epstein sculpture, a cherry tree planted for the visit of Gunzi Koijumi (the father of British Judo) and a memorial to the 5 wardens killed during the 1941 raid which destroyed the Old Church. Cross the road to enter Chelsea Old Church. From the church, a side path leads you to the statue of Thomas More (1478 – 1535) who lived here. His accommodation stretched from the river to King’s Road. He had a barge moored here to whisk him to Westminster or Hampton Court for business. Nothing remains of his property any longer. And he was executed at Tower Hill for refusing to accept Henry VIII as head of the church. Turn left into Lawrence Street, going past the Cross Keys pub. At the junction of Justice Walk, cross the road, turning back to look at the slanting archway of Dukes House and Monmouth House. Detour down to Justice Walk to #5 (red door). Across from it is the former Wesleyan Chapel of 1841. If you are an English literature fan, then you must visit Thomas Carlyle’s House, just 50 meters down on Cheyne Row. The house, preserved as it was when he lived there, was a magnet for the literati at that time, such as Dickens, Browning, Tennyson and a very young Wilde. The highlight, for me, was having the chance to read Jane’s (his wife’s) lively letters, which in my opinion, are a complete contrast to Thomas’s heavy historical accounts. There is also a statue of Carlyle (1795 – 1881) towards the river, along Cheyne Row. Back at the Catholic Church, continue onto Glebe Place. Follow the road round to the next bend for the tiny Nursery School at #49, and #50 designed by Charles Rennie Mackintosh for the painter Harold Squire. Continue along Glebe Place and its handsome buildings, looking out for #70 on the right, with its amazing wooden sculptured panelled door. Turn right on to King’s Road. Until 1830, King’s Road was a private road for King Charles II, who used it to travel to Kew. It was only designated as a public highway in 1830. In the swinging 60s, King’s Road became a symbol of “mod culture”. You will soon arrive at Chelsea Old Town Hall. It often has free exhibitions in its elegant hall. It also has an ornate clock suspended between its main entrances. At the next corner there is more Wesleyan influence, the old Methodist Sunday school, followed by the blue tiled church. Continue along King’s Road to the Saatchi Gallery (daily, 10 -5), on the Duke of York Square. After your visit to the gallery, Sloane Square Station is to the right, along King’s Road. Chelsea Old Church – Open to 2-4 p.m., Tuesdays to Thursdays only, and Sunday p.m.
Thomas Carlyle’s House, open Tues – Sun, from April to October only. The Colbert offers croissant and coffee for around £8 (open daily from 08:00). The Pie Man at Chelsea Green (open 06:30 daily, closed Sunday). Cafe at St Luke’s church. Duke of York Square, with numerous restaurant choices. Casa Manolo, sells jamon sandwiches to takeaway. Royal Court Theatre have cheap £12 Monday tickets available online on the day. Cadogan Hall have affordable performances, with cheaper Sunday evening performances.